If there’s one thing that I’m sure Miss Manners and Dr. Ruth would agree on, it may very well be that men’s discussing toilet behavior or general bodily function is probably not the world’s best way to get into a woman’s heart. I’d even be as bold as to say it’s probably not in the top 100 and it definitely isn’t something moviegoers want to see several times in the first ten minutes of writer/director Bart Freundlich’s latest romantic comedy/drama about the ups and downs of relationships. 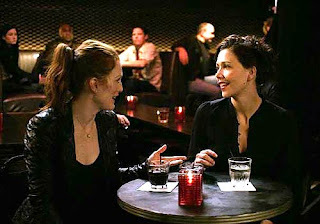 However, the reputation of the film’s actors including Julianne Moore (wife of Freundlich), David Duchovny, Billy Crudup and Maggie Gyllenhaal keep us watching even when we realize that not only can we not identify with the four characters onscreen but we’re not exactly sure that we care that much about them as well, despite feeling a certain kinship with the long-suffering female characters who we feel are both worthy of better male counterparts and a more sophisticated plotline to escape the juvenilia. The film centers on two couples who are slightly past their expiration date and must realize whether or not they’d like to try and keep things fresh and stay together. Rebecca (the luminous Moore) is a talented actress beginning a challenging play with a pompous director whose concentration is blown by her relationship with sexually demanding Tom (Duchovny), her beloved husband who has quit his loathsome employment in advertising to be a stay at home father only to discover he’s not sure just what to do to fill his time. In between grocery shopping and flirting with another mom at his son’s preschool, Tom phones and meets Rebecca’s brother Tobey (Crudup), an equally immature freelance writer whose days are filled going to therapy and moving the car he never uses from one side of the street to another to find legal parking. Having never graduated to a mature e-mail address, Tobey uses his obscene screen-name to chat with his girlfriend of seven years Elaine (Gyllenhaal) while she busily multitasks at her publishing job and plugs away on her children’s book. When the idea of a long-term commitment and child enter Tobey and Elaine’s relationship, the two break-up only to find that their struggles echo the ones of their married good friends Tom and Rebecca as the men, predictably must learn to come-of-age belatedly and accept responsibility in their life in an overly stagey and contrived finale set in Lincoln Center. Although more accessible and entertaining than the director’s over-praised The Myth of Fingerprints and self-centered male drama World Traveler, as simply a film without comparison to the director’s other works, Trust the Man isn’t all that trustworthy of a movie rental in the overpopulated forty-something (second) coming of age independent comedy subgenre.